If you love dogs and have some spare time, please consider volunteering at your local shelter or Humane Society. The animals need attention from people that care and love them. Just a little time to walk a dog or pet a cat will give the animal great pleasure and warm your heart. You can help without ever adopting another animal. Give a little time to help make the shelter animals lives better. If you want to do more, most shelters are always looking for volunteers to help with their activities. Most rescue groups welcome new members to help support their work. 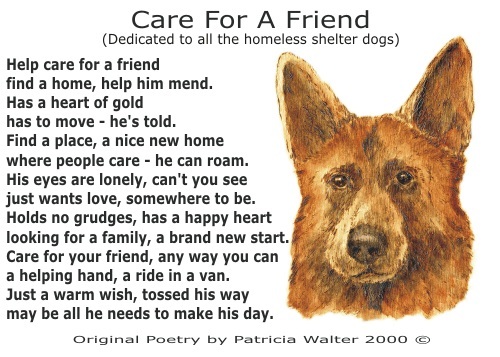 They need people to go to shelters to check out dogs, help transport dogs and foster dogs in their own homes. Fostering is a difficult activity since you always fall in love with the foster dogs, but it is the only way for many dogs to be rescued and find new loving homes. They need to be away from the shelter and in a home environment. You heart breaks each time your foster finds a new home, but it also means there is another opportunity to save another animal from the shelter. Consider helping your local shelter or rescue group. You life and effort will be well rewarded for your time. You will feel better and the animals you help will feel loved again. find a home, help him mend. has to move - he's told. where people care - he can roam. just wants love, somewhere to be. looking for a family, a brand new start. a helping hand, a ride in a van. may be all he needs to make his day.